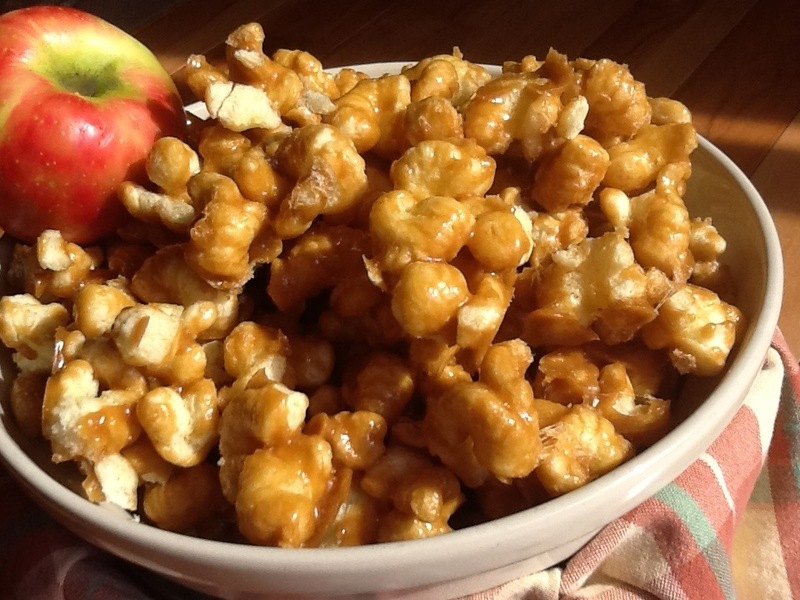 My mom would make caramel corn when I was younger back home. (Thats sound like I live far away but we are 14 minutes from each other) She will still make it if we ask or beg. Nellie is in the stage now of deciding if she really wants to cook because that means she would have to just clean it up, and who would eat it if she made it? It’s just her and dad at home now. She has said it’s harder to cook just for two. It used to be 6 but we all have flown the coop. I suppose that would be a hard adjustment to get used to. I don’t have to worry about that for awhile especially with boys, they have bottomless pits for stomachs! 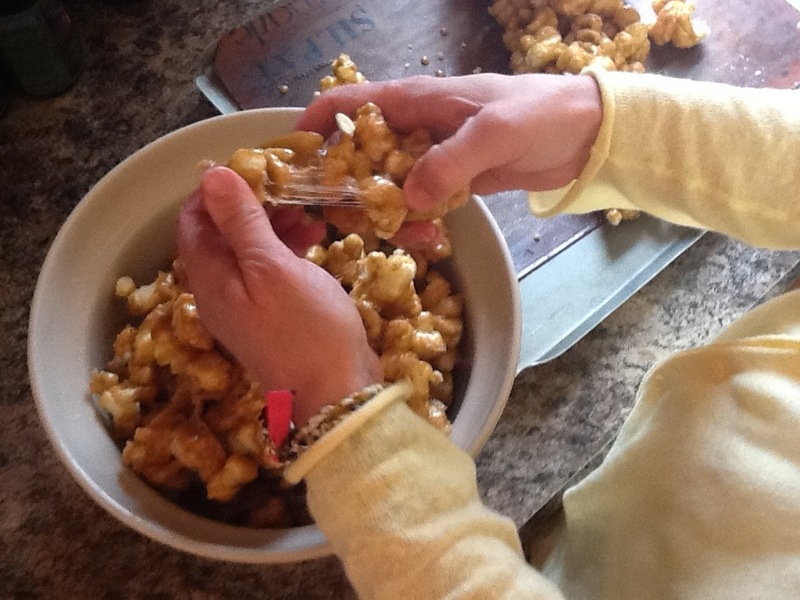 Even though I love moms recipe of caramel corn, I equally love this recipe because it has no kernels to get stuck in your teeth! Save those teeth! So, when the fall season peeks its head around the corner with the first whisper of cool air, this recipe is always one of the first I make every fall. This is the perfect hayride food! Seriously how could anything with brown sugar and butter taste bad?! 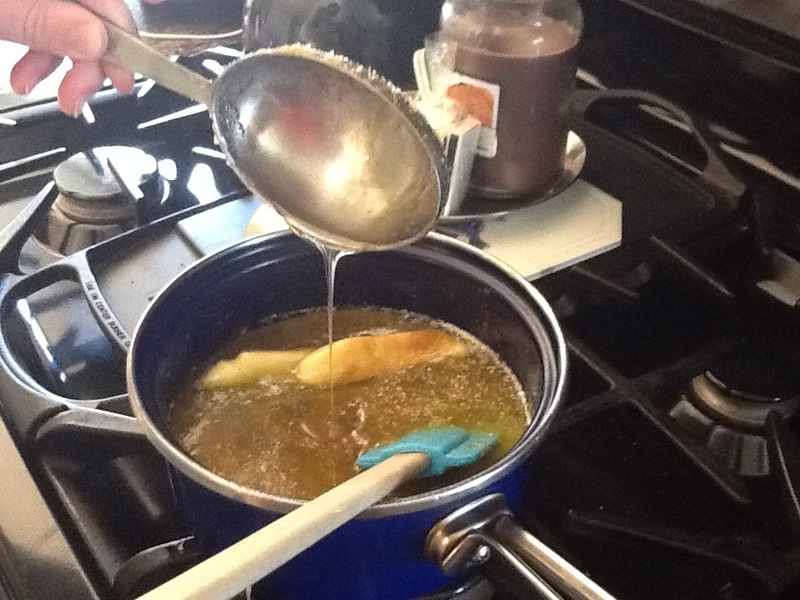 Once the butter has melted then you start the boiling stage. Don’t start your timing or turn up the heat until the butter is melted. 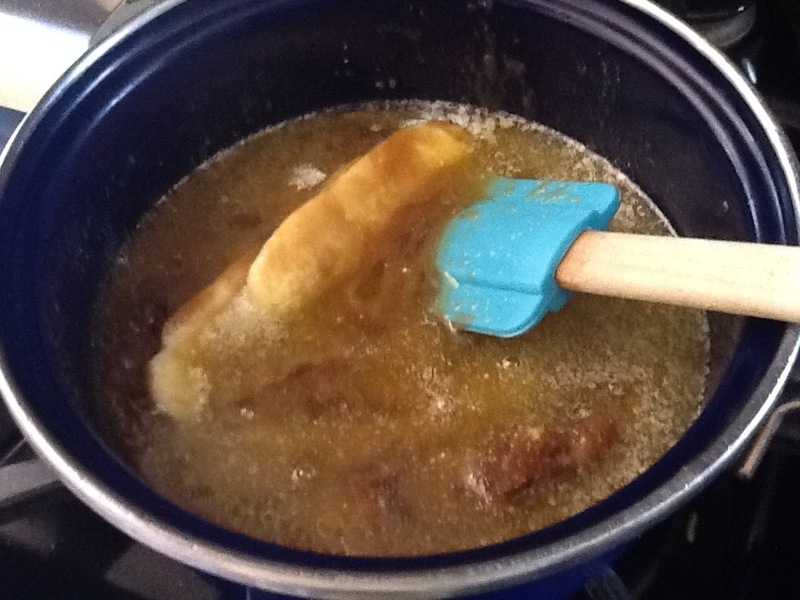 Turn up the heat after the butter is melted completely. 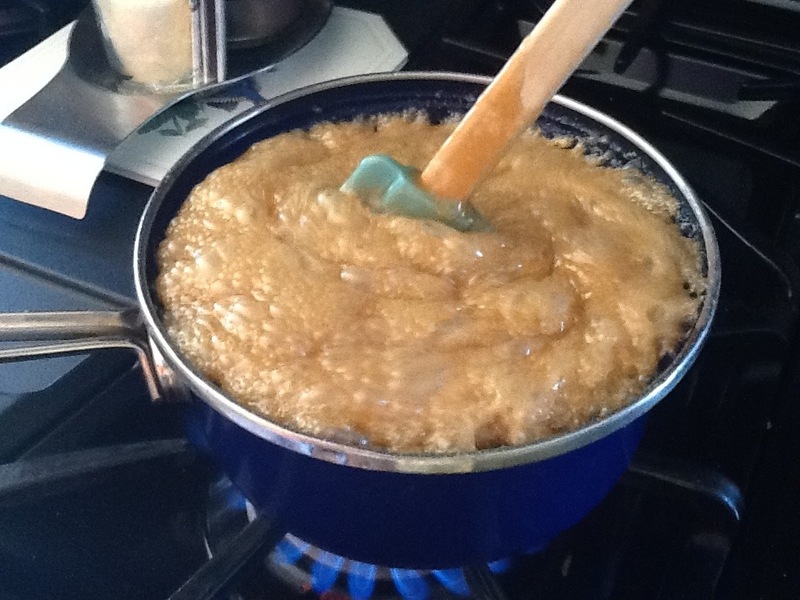 This will prevent any gritty sugar from forming and burning. 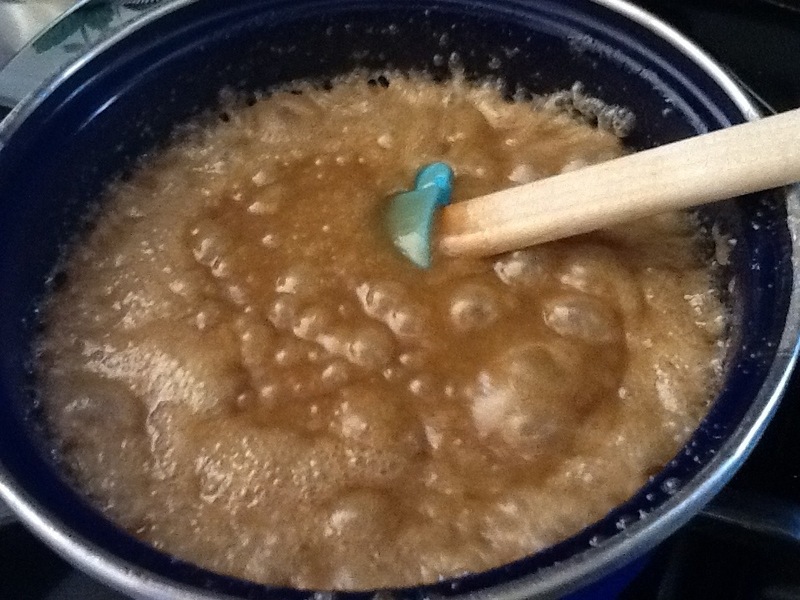 After 5 minutes remove from heat add baking soda. 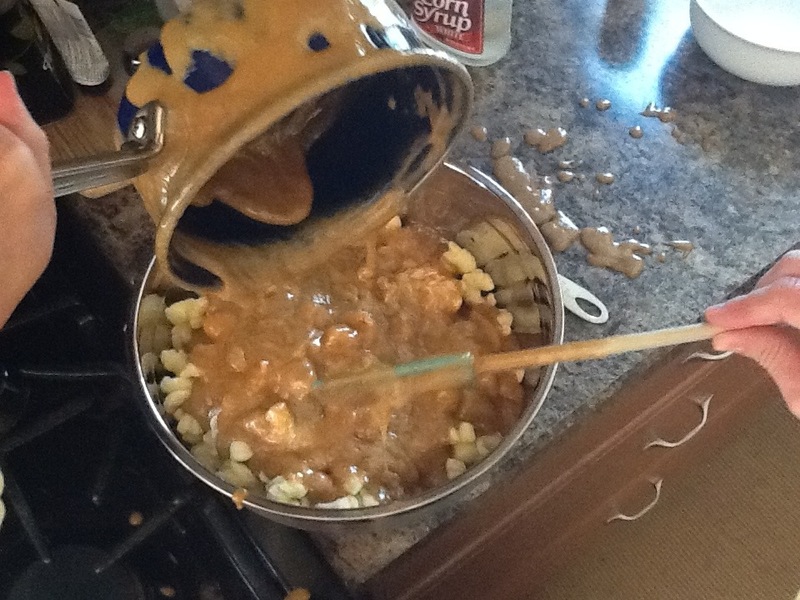 This is when I was wishing I used my bigger saucepan, I know better then this!!! Stir in the baking soda. 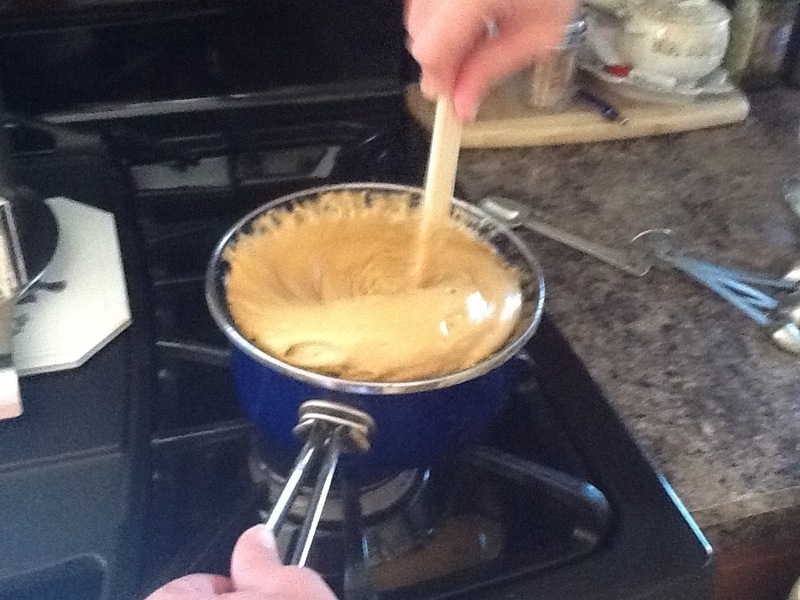 It will begin to make the hot caramel foam up. Just like those volcanoes we did in science class. But it taste and smells a lot better! Oh crap! Don’t ever get boiling sugar on you! It hurts like HOT HOT GLUE! In all reality I wasn’t too worried about burning myself. I just didn’t want to loose any ingredients. This was 2 sticks of butter! Butter ain’t cheap! In a large bowl pour in the corn puffs. 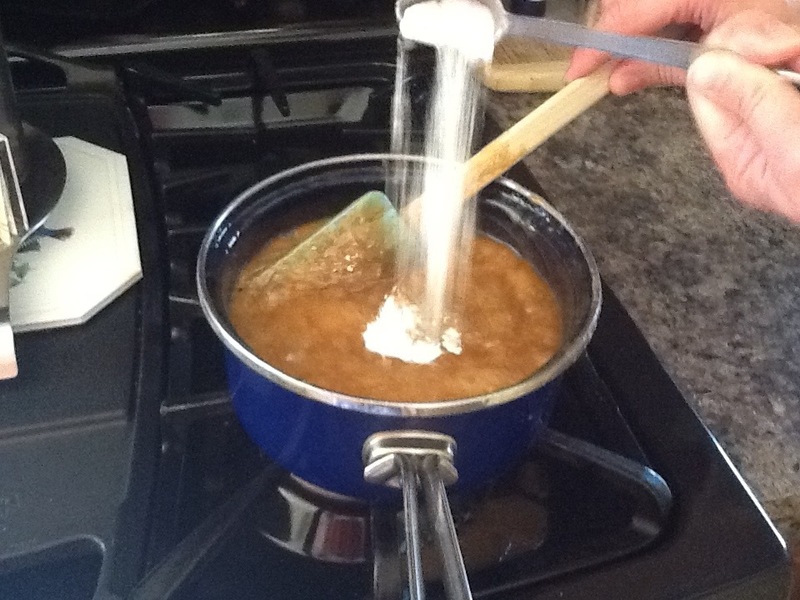 Tip: have this step done before you even start the caramel. 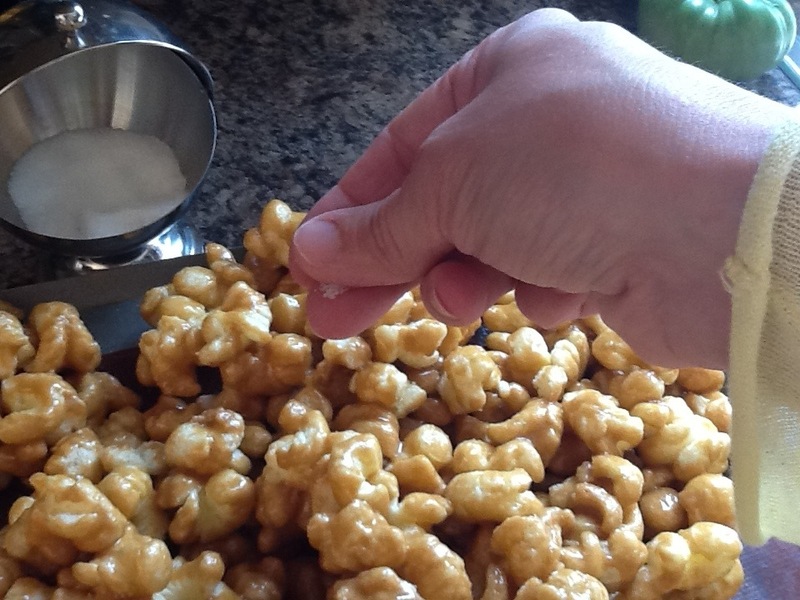 From this point on, once the caramel is done you need to pour it immediately on the corn puffs. See my spill over on the pan?!! 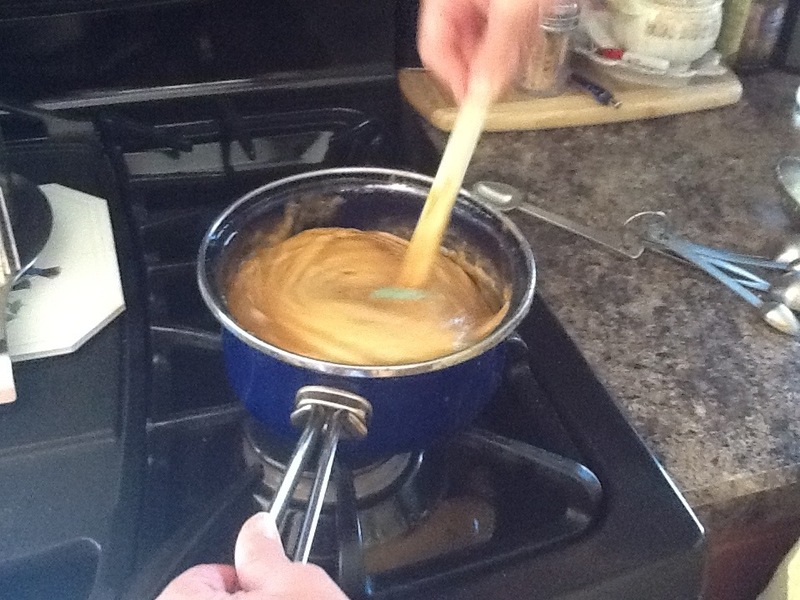 And on the counter…..messy cooking day. 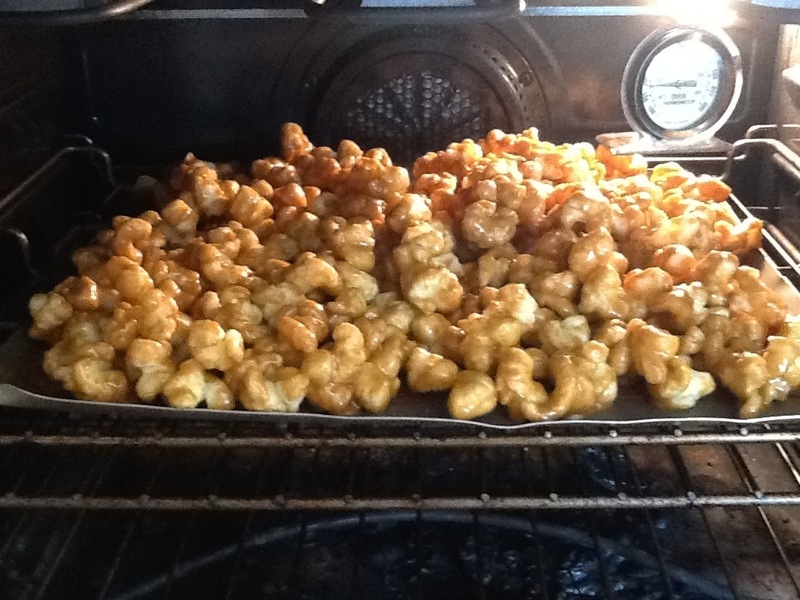 Don’t think I didn’t open the oven a couple of times and sneak a piece! Ok, maybe more then twice…. 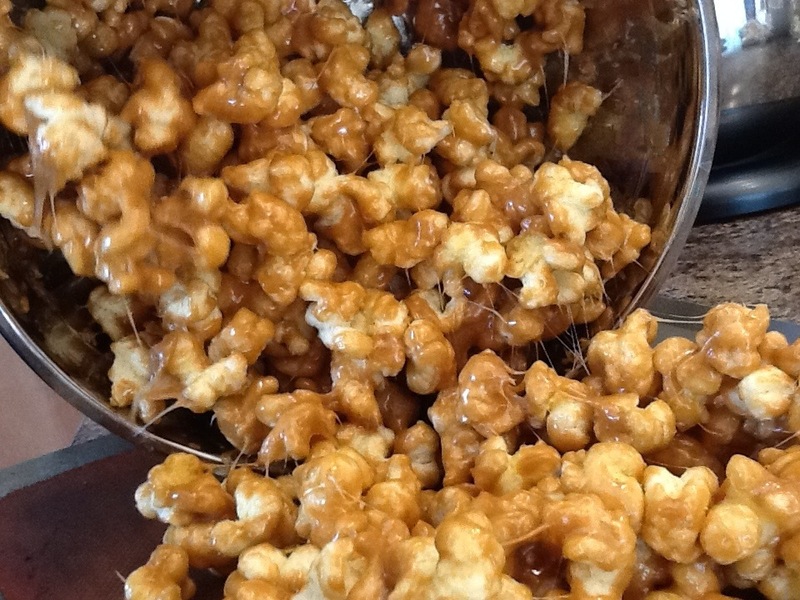 I have absolutely no “off” button when it comes to caramel corn. 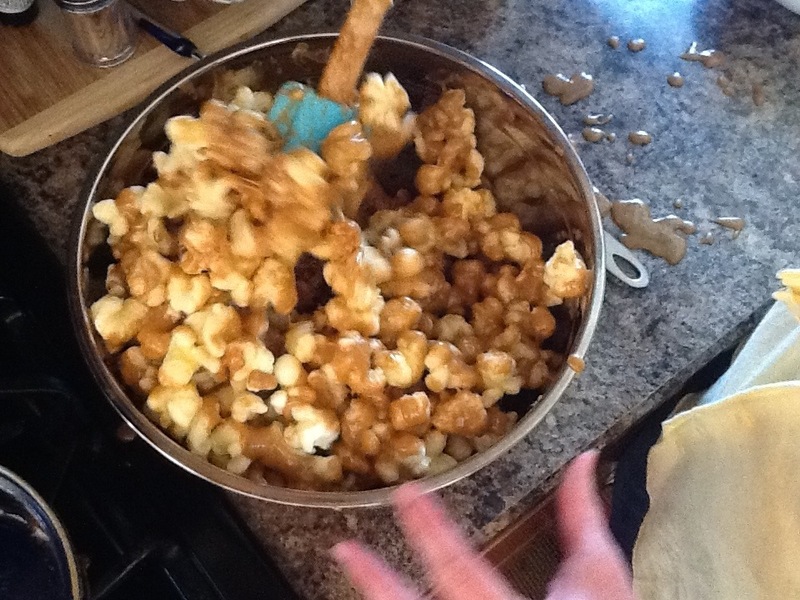 I smiled, real big, to see your mess — that is THE ONLY thing that stops me from making caramel corn for every gift-giving season – I’m sooooooooooooo messy – God Bless Mr. Clean-up, he’s the best! 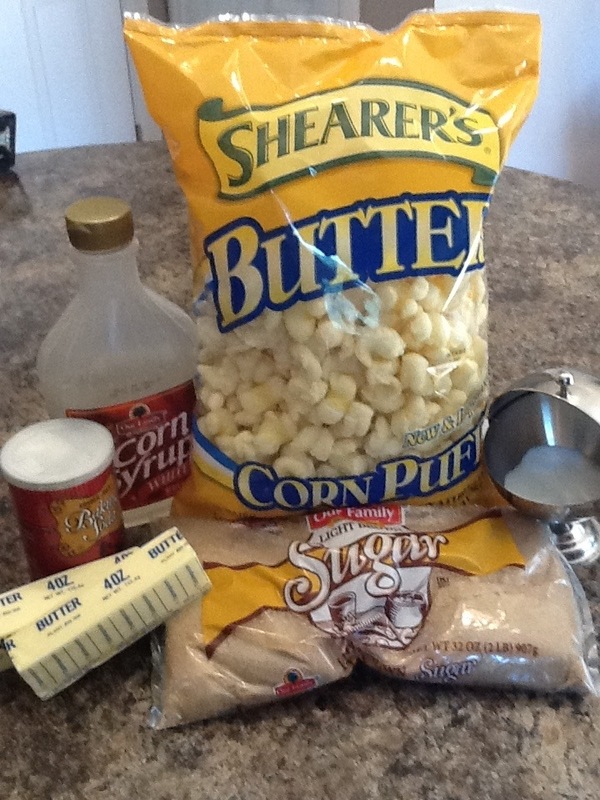 I’ve never tried anything but popped corn – how thoughtful of you to use kernel-less products! A-1 thought! How did you get your husband to be a “Mr. Clean Up?” You can share that recipe! P.S. I wish I could use delayed gratification when it comes to opening your blogs – I just want to savor them and it seems I’m always in a kinda hurry when I’m checkin’ mail. They’d all make a nice coffee table book !!! YUM! YUM! YUM! 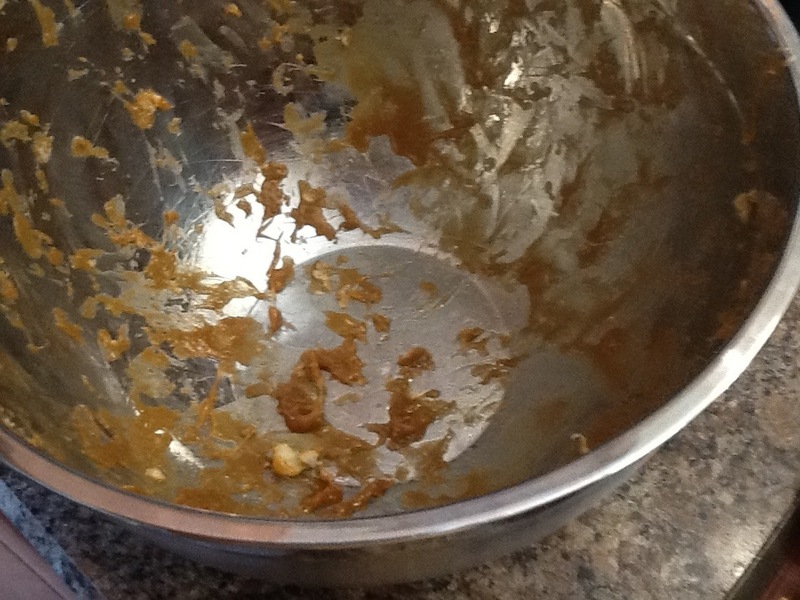 Mom and I ate a whole bowl of her caramel corn once and we still wanted more. So delicious!! 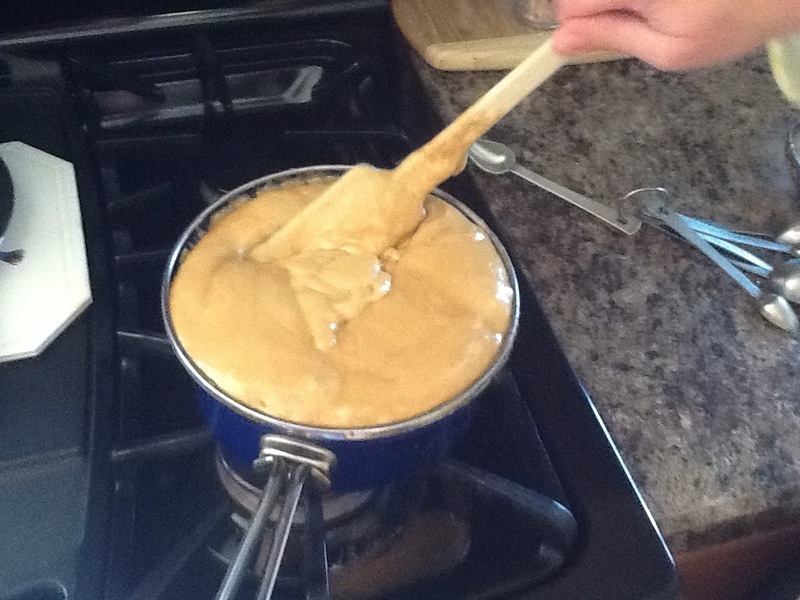 CARAMEL CARAMEL…who doesn’t love it! Still would love it if one day you made that recipe of caramel shortbread with sea salt….Christmas is coming 🙂 Just saying!